Hi, my name is Mel, and I'm addicted to Diablo 3. Diablo is one of the few games I've played where you can't customize your character at all. You pick the class, and you pick male or female, and they look like what they look like. They end up looking different to some extent because of their clothes, though, anyway. 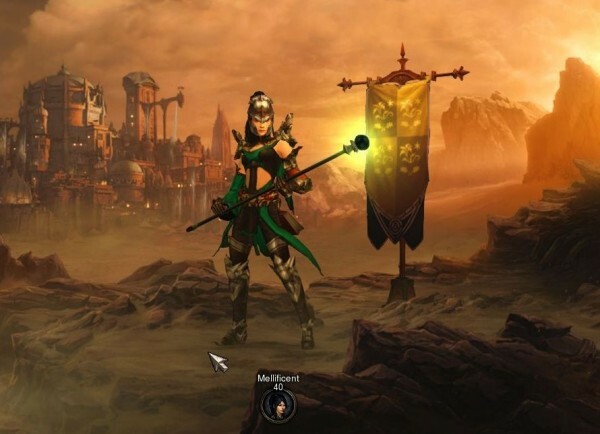 Drops in Diablo are sort of randomized, and every weapon and every piece of armor has slightly different stats and there are a number of different skins for each kind, too. This is one of those entries. It's cold. Well, cold by our standards. We didn't get any ice-storm like Dallas did (so far, at least) but it's 39 degrees (F) at 4 in the afternoon, that's cold for us. The good news is that - according to my phone, anyway - it's not going to get much colder. They had 39 for the low. This kind of seems like that kind of weather - it's still overcast and I can see that it might just stay the same temp. Which is good, I'm not even wearing socks. Socks do not like to stay on my feet well, so I don't put them on until I'm absolutely freezing. But much colder than it is now and I think I would have to! One thing I found in that process was this great still from Dazed and Confused. I love that movie, and I can't believe it's 20 years old. (There's a Rolling Stone article about all the music that's 20 years old this year - two words: bee girl! - but if there's something similar for movies, I haven't stumbled across it so far.) D&C has always seemed really personal to me because most of the movie characters are the age I was at the time the movie is set - that is, finishing their junior year in 1976 - and because Linklater gets everything so unbelievably right. If you weren't around then, or were around but not that age, even, you just wouldn't believe how right this movie got everything. Just... everything. I can't even really pick one thing to talk about. Not just the colors, but the clothes, the cars - the hair, oh god - the way everybody talks and the things that they do, it's all like a time machine to me. I'm sure it helps that I grew up in suburban Houston, and the movie is set in Austin (which is where I went to college), so it's literally as well as figuratively pretty close to home for me. -- I haven't watched it in a while, either; it's clearly time for a rewatch.